Create a constant reminder that MS will not get the best of you by attaching this Multiple Sclerosis Awareness Key Chain to your keys. No matter where you are headed in life, you will always show that you are a fighter, a warrior and you are someone who will never give up the fight. Multiple Sclerosis Gift Ideas are also great for event giveaways & make ideal awareness walk keepsakes. 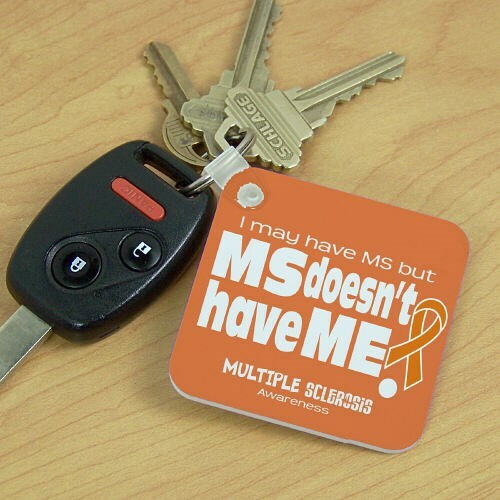 Our Multiple Sclerosis Awareness Key Chain is perfect for spreading awareness.This Awareness Key Chain measures 2 1/4" x 2 1/4" and is 1/8" thick. Your Key Chain is made of fiber glass reinforced plastic and includes a key ring. Additional Info Multiple Sclerosis affects approximately 400,000 people in the US and an estimated 2.5 million worldwide. By showing awareness, you will help support MS and also help fund research for a cure. Take a look at our entire collection of MS Awareness Walk Gear & Apparel to show your support today! You may also enjoy this great design in our MS Awareness T-Shirt.